Well, nothing per se, but there are a few minor issues. First, the gradient is borderline blah. Carly is another Republican trying to escape the use of red in her brand. It’s a popular trend this year considering how many Republicans are fronting Democratic blue, but this deep sea tone is just a trifle murky for our tastes. And while the text treatment is quite well done, Fiorina has taken a trip down the diva highway, running on the strength of one name. Unfortunately the name she picked carries the strength of a twelve year old schoolgirl just trying to balance math class and a prom date. It can’t be helped, really, thanks to the Disney Channel. Damn shame the kids that watched that show aren’t old enough to vote yet. 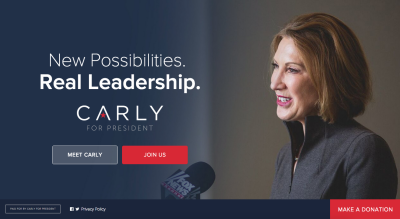 Carly appears to be running from her last name, like many other candidates this cycle, but in her case I think it’s more likely because whatever treatment you give to Fiorina, it almost always looks like a fashion ad. Trouble is, when Carly changed her brand a few months back, despite eschewing her Italian monicker, she still ended up with a fashion ad! Macy’s is having a sale! Aiyeee! Mrs Nosferatu is going to eat my baby! It’s a mash-up of typical campaign stuff, but unmistakable. Our advice: Let your ambition and ego take a backseat to the people, like a true leader might do. Use the alliteration and near-rhyme God gave you. Meaningless stuff like this has a way of taking hold of the collective voter sub-concious; Tippecanoe and Tyler Too! Keep Cool With Coolidge! I Like Ike! Fiorina For America! Well… it’s as close as you’re going to get. Grab ahold.